The 34th Forest Products Machinery & Equipment Exposition will be held June 14-16, 2017 at Atlanta’s Georgia World Congress Center. 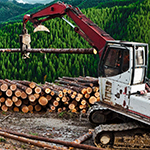 Timken, a leader in products supporting the Forest Products industry, is showcasing our expanded power transmission product lines including Carlisle belts by Timken. Come see us at booth #1046 or visit: https://www.timken.com/resources/forest-products-machinery-equipment-exposition/.